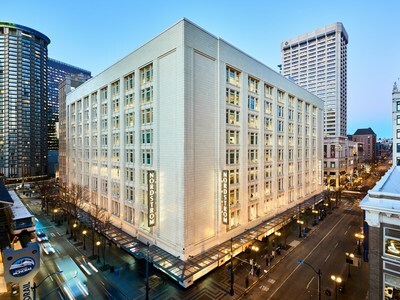 SEATTLE, March 5, 2018 /PRNewswire/ -- Nordstrom (NYSE: JWN) announced today a partnership with Anthropologie (Nasdaq: URBN) to introduce more than 200 items from Anthropologie Home at select Nordstrom full-line stores and on Nordstrom.com, beginning March 19th. The Anthropologie Home collection will encompass categories including kitchen, dining and entertaining, bed and bath textiles, room décor, stationery and hardware. "We are thrilled to be launching the best of Anthropologie Home into 15 Nordstrom stores and on Nordstrom.com. Home is a category we continue to evolve and being Anthropologie's partner will allow us to introduce dynamic home product with a regular cadence," said Gemma Lionello, executive vice president and general merchandise manager, Nordstrom. "We look forward to providing our customers with another way to shop one of their favorite home brands." Anthropologie Home at Nordstrom represents a mix of classic and iconic pieces, new seasonal designs and exclusive artist collaborations. Work from 20 artists, discovered around the world, is reflected in the wide range of techniques, mediums and styles in the collection. They include Massachusetts-based ceramicist Molly Hatch's whimsical creations, painter and UK native Sally Muir's dog portraiture, Los Angeles studio All Roads Design's artisanal textiles and North Carolina's Suite One Studio's watercolor inspired designs. "Anthropologie Home has evolved significantly over the past several years, becoming a sought-after design resource for every room of the home. We are thrilled to take this important next step with Nordstrom as our partner in the United States," said Andrew Carnie, president of Anthropologie home, garden and Europe. "We look forward to sharing our unique voice in home with their customers in a meaningful and engaging way." High resolution images of Anthropologie Home items available at Nordstrom are available for download in the Nordstrom press room. Founded in 1992, Anthropologie is an omnichannel lifestyle brand that celebrates fashion, art, culture, design and discovery. Led by David W. McCreight, President of Urban Outfitters, Inc. (URBN) and CEO of the Anthropologie Group, Anthropologie currently maintains 226 stores in the U.S., Canada and Europe, as well as a popular catalog and website. The company is part of URBN's portfolio of global consumer brands comprised of Urban Outfitters, Anthropologie, Free People, BHLDN, Terrain and the Vetri Family.